In c.1520 the Venetian nobleman Marcantonio Michiel saw a painting of a banker and his client in Milan by Jan van Eyck which he noted had been painted in 1440. The lost original appears to have been the catalyst for a popular type of painting in the sixteenth century showing a similar subject matter, where the figures wear fifteenth-century dress (which would have looked archaic) and have grotesque features. There are around sixty surviving sixteenth-century variants which can be divided into two categories based on original works by two artists: Quinten Massys (1465/6-1530) and Marinus van Reymerswaele (c.1490/95-c.1567). The Massys original no longer survives, but was probably initially conceived as a distorted follow-up to his earliest secular painting The Moneychanger and his Wife, 1514. The Marinus van Reymerswaele variants derive from the signed Two Tax Gatherers painted in the 1540s (Ministère des Finances, Paris). An example of this is the replica in the National Gallery, London, created in Reymerswaele's workshop, using a tracing of the original. 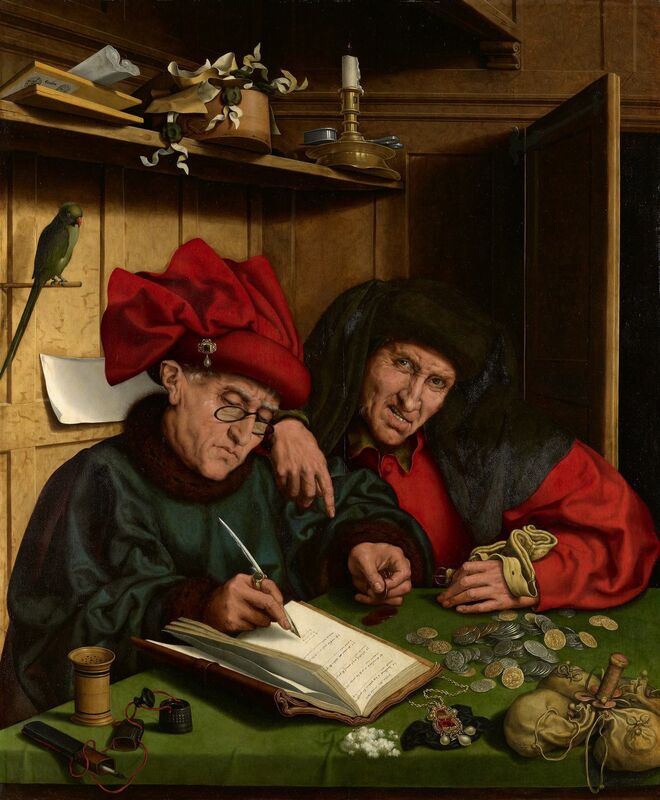 The present work is based on Reymerswaele's original Two Tax Gatherers, and although a tracing may have been used for the main elements of the composition, the hand of a distinct artist can be discerned in the refined painting technique and the inclusion of individual elements not present in the Paris picture, such as a parrot on a perch and an elaborate moneybag on the table. The present work is very close to another version (National Pushkin Museum, Moscow) and it seems most likely that the artist was a talented follower of Marinus van Reymerswaele. Cleaning and conservation have revealed the high quality of the painting and the precision of details, such as the change in skin tone when seen through the spectacles worn by the man on the left and the blemishes in the skin of the man on the right. The freer underdrawing and livelier handling of paint in this man's face and hands contrasts with the tighter depiction of the still life on the shelf above. The scene shows two men with faces contorted in concentration and greed. The man on the right points at a ledger, which is being filled in by his colleague on the left. The wealth of both men is suggested by their rich, albeit anachronistic, clothing. The exchange rates in the ledger are written in French. These give valuable clues to the dating of the picture, as the rates listed first came into use on 11 July 1548 and were superseded on 16 December 1551. The language used for the ledgers in the various versions of this painting differs between Dutch and French. The French language in the present work probably indicates that it was painted for a French patron, or perhaps the artist lived in a French-speaking area of the Netherlands. The crowded nature of the scene, with the two figures positioned tightly together and the desk placed impossibly close to the door, lends the painting an uncomfortable atmosphere. The table is littered with coins, which are being evaluated by the men according to the latest exchange rates. The two figures have traditionally been called 'Misers' (this is retained in the title of the present work), but are most likely tax collectors. The scene is intended to amuse the viewer with its caricature-like features and colourful costumes. However, the underlying message is a warning against greed, because life is short, as symbolised by the flame of the candle which will soon burn out. The painting is marked with the brand of Charles I on the reverse, having probably been bought by his mother, Anne of Denmark, in 1619. In the Commonwealth Sales it was described as '2 Userers A Coppie After quintin', valued at £5 and sold to Hunt and Bass.27 Major Edward Bass was responsible for leading one of the syndicates of civil servants granted paintings or items of furniture in lieu of debts owed to them by the Crown. The low value given to The Misers, at that time believed to be a copy after an original by Quinten Massys (1466–1530), is clearly demonstrated when compared to a Madonna by Raphael that was also sold to Bass for £2,000. The Misers was recovered at the Restoration and by 1666 was hanging at Whitehall in the Green Chamber, next to the State Bedchamber ('Quinten. Two Jewes writing in a booke wth mony & a Jewell before yem'). Notably it was the only painting by a northern artist in the room, the rest being portraits, mythological subjects and religious pictures by Italian artists, including Lorenzo Lotto (c.1480–1556; cat. 134) and Giulio Romano (for example, rcin 402781). By 1688 it was still at Whitehall, but had been rehung over the door in the 'Great Antye Chamber in the New Lodgings'.29 This important room largely contained highlights from Charles I's collection,including Van Dyck's Three Eldest Children of Charles I (RCIN 404403) and Cupid and Psyche (RCIN 405571), and Orazio Gentileschi's Joseph and Potiphar's Wife (RCIN 405477). Catalogue entry adapted from The Northern Renaissance. Dürer to Holbein, London, 2011.